Inspired by the influence of Chen Chong Swee and refined by the tutelage of Cheong Soo Pieng, the works of Sim Pang Liang moulded the inspirations of his first generation ink visionaries into a characteristic symphony of ever-changing contemporary style. 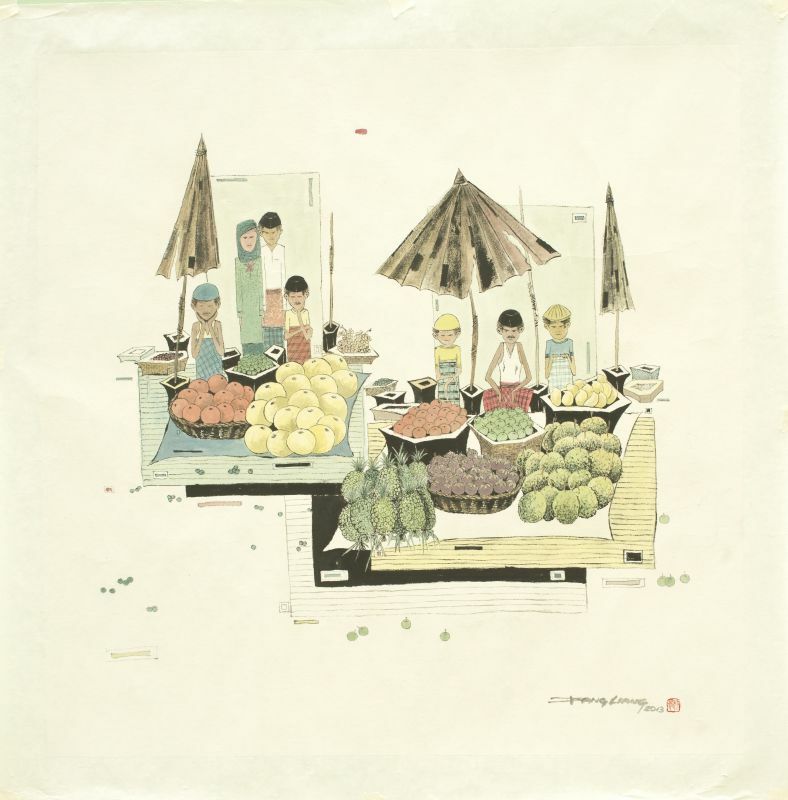 Majoring in painting at the Nanyang Academy of Fine Arts where he graduated in 1961, the artist gleaned much knowledge from his teacher, Cheong, and in 1963, was selected to join a small group of artists that founded the Modern Art Society. Exploring the many dimensions of modern and abstract art, Sim soon became renowned for his innovative takes and dynamic reinterpretations of the classic form of ink. With his signature style, the artist exemplifies technical traditions while constantly moving forward with the inclusion of fusion and innovative conceptual subjects. Spanning calligraphy and ink washes, incorporating abstract and methodical forms, the artist’s repertoire consists of a wide range of imagery - a testament to his progressive outlook on art. Ode to Art is proud to present to you, the radical and impassioned works of Sim Pang Liang. The history of Chinese ink has most often told us of grandeur, dramatic landscapes, and deeply spiritual energy, depicted through calligraphic text and image. Combining the meticulous detailing of ‘Gong Bi’ with the imagination-fueled ink wash, in his most recent works Sim Pang Liang exponentiates both worlds of traditional Chinese ink into a contemporary style that brings to focus and effaces the normative principles. 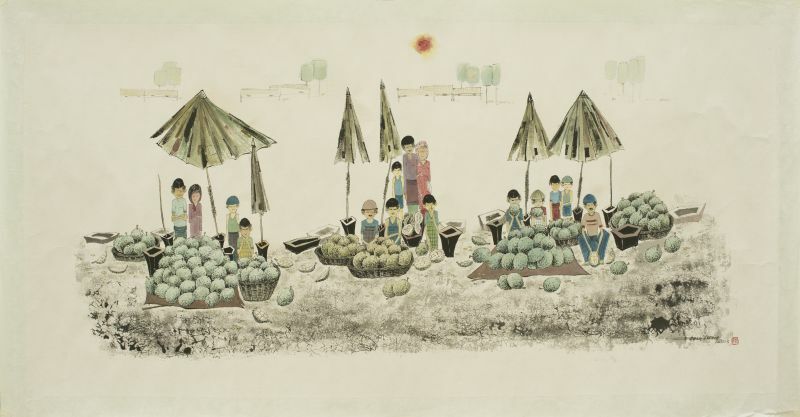 Freeing himself from the constraints of subject and representation of canonical inks, Sim Pang Liang turns away from grandeur and scholarly reproductions and instead, brings to light the simple man, housed in markets and selling wares. This is one of the most commonplace and yet, culturally significant acts that take place in a community. Despite conceptual deviances into the contemporary, the artist still retains the technical strength celebrated by the art form in terms of definition of line and control of medium. Representing still life in every shadow and contour, the artist is able to render minute detailing with his ink and yet displays a minimalistic landscape to outline the foreground of his subject. The combination of detailing and vast expanses is characteristic of the Chinese ink art that is employed here by the artist to exemplify his stylistic orientation; his long fascination with the dance between dark ink, rice paper and water that transforms into a hue that makes for depiction of subtleties, masking the meticulous in an extraordinary encapsulation of the ordinary. 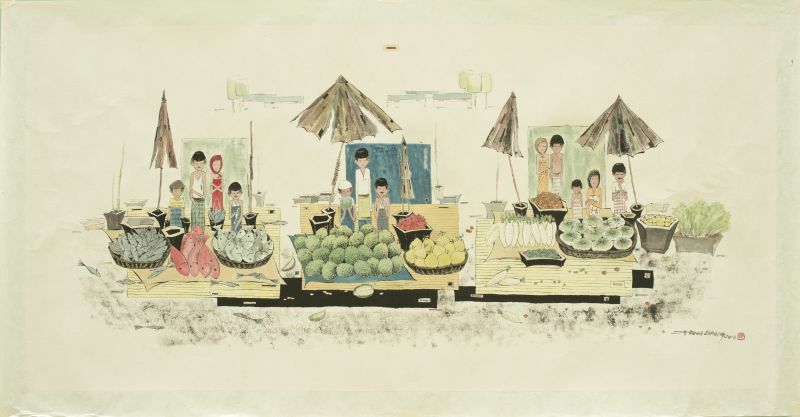 The distinctive use of simplistic subjects, such as those of market vendors and their commonplace goods of vegetables add an air of rustic sensibility that offers an air of nostalgia to viewers, bringing to mind a culture almost lost to us in this age of globalization and progressive urbanism. Carrying cultural significance and at the same time, bringing to light a component of society that is often not recognized in its role, the artist does not simply depict, but tells a story through each face and every situation he depicts. The ink strokes of Sim Pang Liang are thus, not only images of iconic and skillful process, but cultural symbols, as well as reminders of an age steadily passing us by. 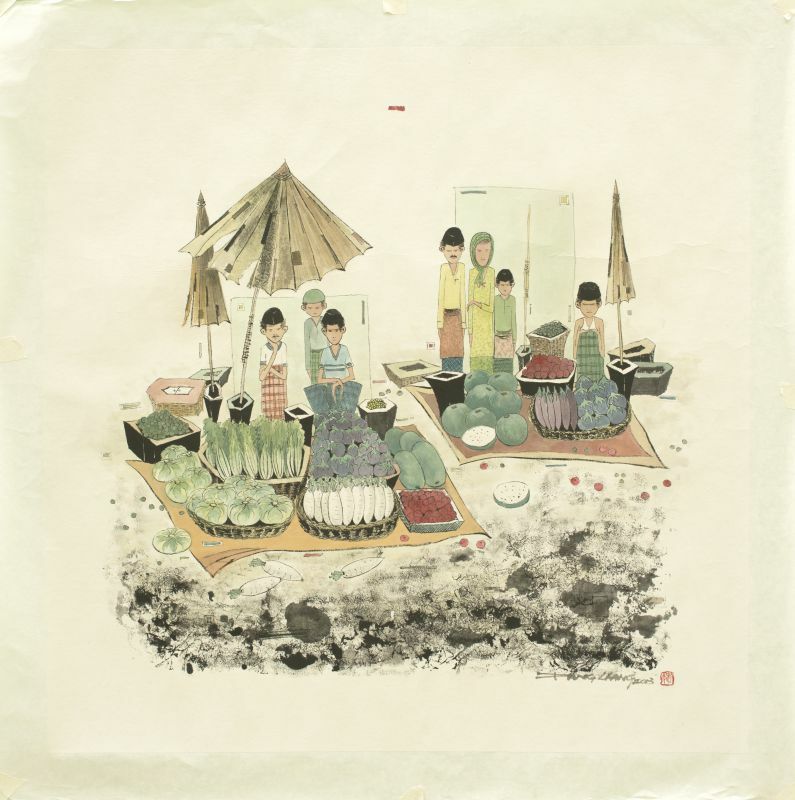 Highly celebrated for his modern Chinese Ink Paintings and a multiple award winner, the artist has exhibited extensively in Southeast Asia and is collected by prestigious institutions including national galleries in Singapore, Kuala Lumpur and Taipei.